Are you looking for Skylanders Halloween costumes? Currently, there are two great options available for the die-hard Skylanders fan! As fall approaches, many kids begin to think about what they will be for Halloween. 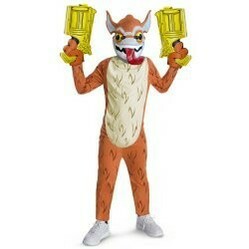 One costume idea that is sure to be extremely popular this year are the new Skylanders Halloween costumes. Currently, there are eight Skylanders costumes available. The characters that are represented include Spyro, Trigger Happy, Crusher, Wash Buckler, Night Shift, Jet Vac, Chop Chop, and Stink Bomb. Trigger Happy is a pretty fun, gun slinging gremlin that loves to shoot stuff. It is, in fact, his favorite thing to do. Of course, my son loves the Trigger Happy costume simply because it comes complete with two gun hand covers. If it has guns, my son is all over it. Also included with this officially licensed Skylanders costume is a orange and yellow jumpsuit and a stylized Trigger Happy character mask. Since they released a Trigger Happy costume it only makes sense that they would also release a Spyro costume; seeing as how they are best friends in the video game. Spyro is a rather young but fearless dragon that has dedicated his life to defeating all evil. As a parent, it is refreshing to see strong characters that also have strong morals and ethical beliefs. I think this is missing way too often in our normal day to day lives. This officially licensed Skylanders costume comes complete with a purple and gold power jumpsuit with attached dragon wings. It is nice that the manufacturers deciding to make these wings permanently attach as detachable wings NEVER seem to stay on as designed! Also included in this Skylanders Halloween costume is a cool character mask that really brings Spyro to life nicely! With the pending release of Skylanders Swap Force many people, myself included, have already started wondering whether or not there will be any new Skylanders Swap Force Halloween costumes. With the overall popularity of this franchise, you would think that Activision would be releasing virtually anything they could. So far, however, this simply does not seem to be the case. Hopefully we will learn more before Halloween. Perhaps the most exciting thing to be released this summer (besides these Skylanders Costumes), are Skylanders Sidekicks. Unlike your normal Skylanders toys, these bad boys can only be obtained by participating in Frito Lay's mail in promotion. How Many Skylanders Sidekicks Can I Buy? As of right now, each house can only redeem four offers.To complicate matters even more, you may not get the figure you requested. If for example, you send in four offers, you may get 3 of one figure and 1 of another; without getting any of the other two Skylanders Sidekicks. With that being said, I plan on asking a neighbor to allow me to send extras to their house. Based on the most current information available, the first Skylanders Sidekicks to be released are Terrabite, Trigger Snappy, Whisper Elf, and Gil Runt. We will, of course, keep you up to date with any breaking news! Are You Planning on Buying Either of These Skylanders Halloween Costumes for Your Kids? The Smurfs have come into their own again as characters for Halloween Costumes with the 2011 movie. Why not choose a Smurfs Halloween Costume and turn yourself blue for Halloween? Captain America Costumes are going to continue to be incredibly popular following the release of the Movie which has been a great hit. What better way to show your patriotism!